There are so many interesting hiking routes to the top of Cadillac Mountain that it may be hard to keep track of them all and choose which one(s) to hike. Aside from the popular Cadillac South Ridge Trail, the Cadillac North Ridge Trail, the Gorge Path, and the Cadillac West Face Trail, there are also a few connector trails that are worthy of exploration, including Canon Brook Trail, the A. Murray Young Path, and the Bubble-and-Jordan-Ponds Path. These remote sections of trail traverse around the south side of Cadillac Mountain to hit a few off-the-beaten-path viewpoints and can be included in longer loop hikes through the park. The Canon Brook Trail starts at a roadside parking area along Route 3 roughly one mile south of the Sieur de Monts Entrance. From the trailhead, hike west to cross the small marshy ponds to the first trail junction. The Kane Path heads north to the Tarn (pond), but we'll head south along the forested Canon Brook Trail as it circles clockwise around the south side of Dorr Mountain to pass the junction with the Dorr South Ridge Trail. (This whole section of trail used to be known as the "Tarn Trail.") At the next junction with the A. Murray Young Path, the trail joins up with Canon Brook and starts a fairly steep ascent up the south ridge of Cadillac Mountain. The highlight of this hike is a beautiful open section of rock where the brook trickles through a small crevasse of wedge-shaped steps. This spot offers a great view of Dorr and Champlain Mountain to the northeast. The trail continues fairly large crevasse with wedge-the notched crevasse where the brook trickles through the stepped cracks of the bare granite. The trail continues its ascent to the west and soon enough, we are at the junction with the Cadillac South Ridge Trail by the picturesque Featherbed (pond). 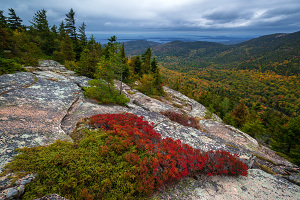 Head north up the South Ridge Trail to the summit of Cadillac Mountain or head west along the Bubble-and-Jordan-Ponds Path to descend another beautiful remote section of trail. 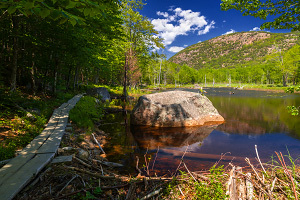 This memorial path named for Andrew Murray Young (an early fan of the island) connects the Canon Brook Trail with the Gorge Trail and follows the gorge between Cadillac Mountain and Dorr Mountain south of the saddle between the two peaks. The lower forested section of the trail follows the gorge's small stream and ascends to the upper section where the well-engineered path navigates the boulder-choked gorge. At the saddle is the trail junction where you can take the Gorge Path west another .4 miles to the summit of Cadillac Mountain or the short but steep trail east to the summit of Dorr Mountain. The Bubble-and-Jordan-Ponds Trail acts as a connector between Jordan Pond and the Cadillac South Ridge Trail. 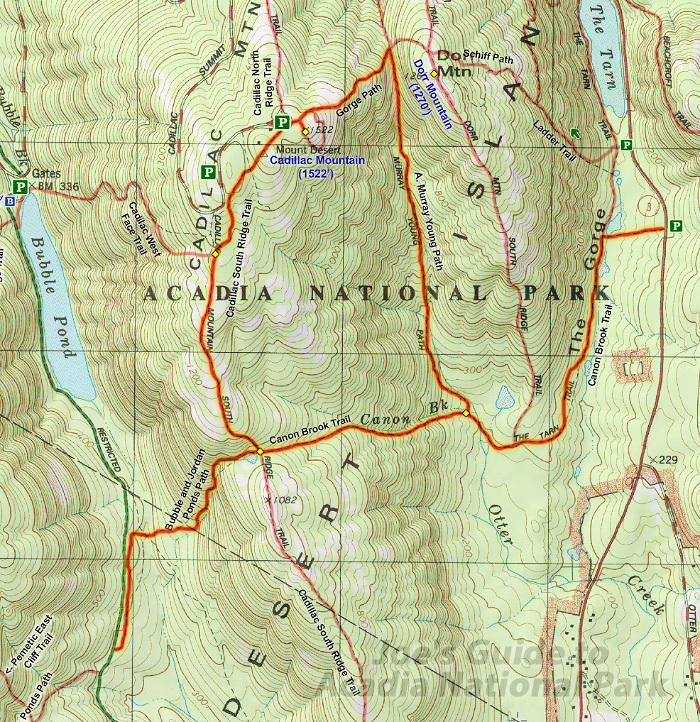 The total trail length from its start at the southeast corner of Jordan Pond to the junction with the Cadillac South Ridge Trail is 2.2 miles, but the most interesting section of this trail, east of the Bubble Pond carriage road ascending the Cadillac south ridge to the junction at the Featherbed (pond), is 1.1 miles. Heading east from the carriage road junction, the Bubble-and-Jordan-Ponds Trail leaves the forested marsh near Bubble Pond and ascends an interesting section of the mountain with several picturesque viewpoints. Iron handrails help in a few spots, but this fairly strenuous section of trail isn't as precarious as the Cadillac West Face Trail. Soon enough you top out at the Featherbed and the junction with the Cadillac South Ridge Trail. I lumped these three remote trails into one description because they are all interconnected and several golden spots make them all worthy of exploration. 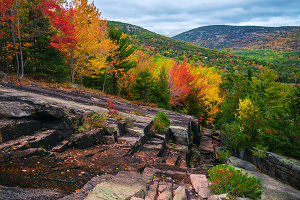 Due to their somewhat remote locations, they do not make for short and simple hikes, so they must be included in a longer loop hike up and around Cadillac Mountain and/or Dorr Mountain.